Vice President, Auditor Mr. Shinichiro Yanagisawa and group of AMCWA visited to Myanmar Maternal and Child Welfare Association on 22nd January, 2019. 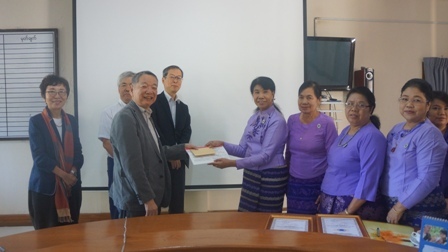 The good will visit was received by MMCWA President Prof. Dr. San SanMyainAung, Secretary Dr. Nwe Ni Ohn, Auditor Dr. Khin Win Thet, Central Executive Committee members DawThan ThanSein, Assistant Surgeon Dr. KhineNwe Han and Executive Director Dr. May Chan Oo from IPPF Project of the association. Firstly, MMCWA President Prof. Dr. San SanMyintAung gave a welcome speech and explained the activities of the association. After that general discussion regarding preschools was carried out. Then, AMCWA Vice President and group provided fund to AmarapuraMyoma preschool of Mandalay Region MCWA and Kyunhla preschool in SagaingRegion MCWA. After that, MMCWA President gave document of honorary to the Vice President and Group of AMCWA. Then, MMCWA members and AMCWA group posed for document photos.